Despite the fact that I own two different tablets I still like to read books in their traditional format – a real book. And I’m always searching for a bookmark that isn’t a sticky note or one of those magazine subscription postcards. This is why I love today’s wedding favor – it’s a cute and very functional gift that your book-loving guests will appreciate. The snowflake bookmarks are a great little gift for your guests, especially if you’re also a fan of books (or if you happen to be in academics)! 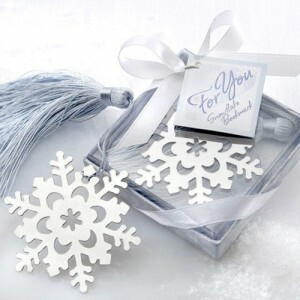 And the snowflake design is really cute and also perfect for your winter wedding. It’s a great gift that spreads a little bit of holiday cheer on your big day. You can find these snowflake bookmarks here.